Meticulously crafted in double-sided intrecciato napa leather, this Bottega Veneta wallet will grow more beautiful with age. Comes with two main compartments and a zip pocket. 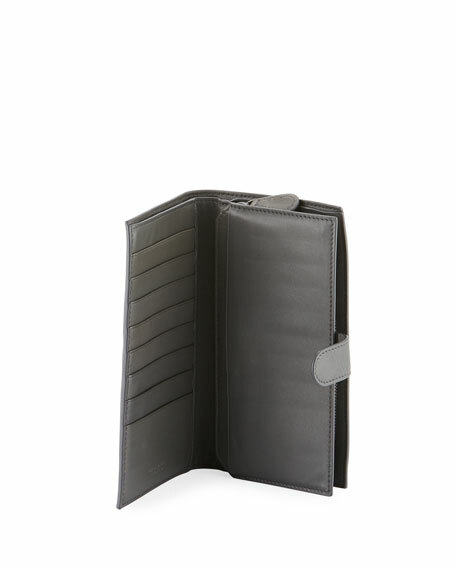 Bottega Veneta signature woven lambskin leather wallet. Fold-over design closes with snap tab. Zip-around back pocket with divided interior. Two bill slots, eight card slots, one slide compartment. Full-size top compartment holds notes and papers. Continental design sized for multi-country currency. 4"H x 6 1/2"W x 1"D.
For in-store inquiries, use sku #168069.